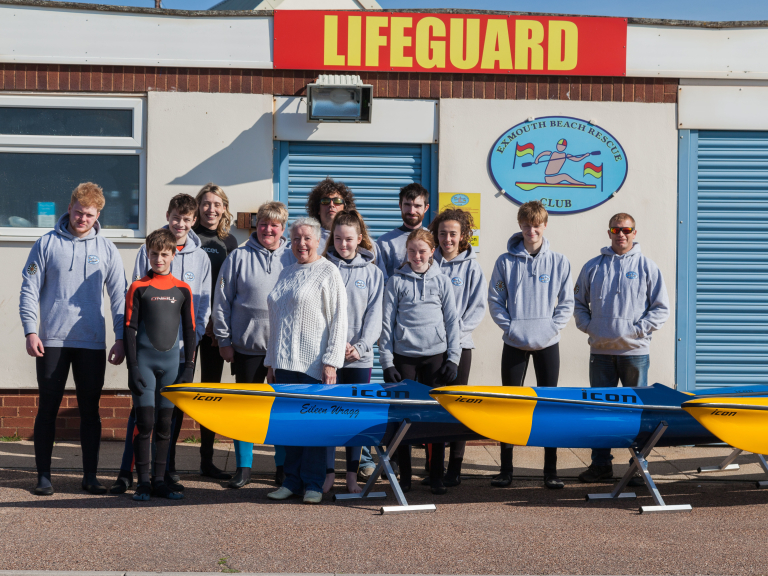 Volunteers at Exmouth Beach Rescue Club are enjoying three new surf skis, thanks to the generosity of Councillor Eileen Wragg. And to celebrate, one of the skis has been named after her – a surprise that she really wasn’t expecting. The purchase of three new Icon skis was made possible when Councillor Wragg, a long-standing supporter of the charity, awarded the club funding from her locality budget grant. Members are now enjoying the warmer weather and lighter evenings and making the most of the opportunity to get out on the water and develop their paddling skills. Whilst some members are taking the opportunity to improve their general fitness and have some fun, others are preparing to compete in the Epic Bay Oceanski Race on Saturday, 17 June 2017. The race, being hosted by the club, is part of the GB Ocean Ski Series. This will be the first time a part of the series has come to Exmouth and club members are looking forward to competing with some of the country’s elite.